I see you lie there among the broken brambles and twigs. 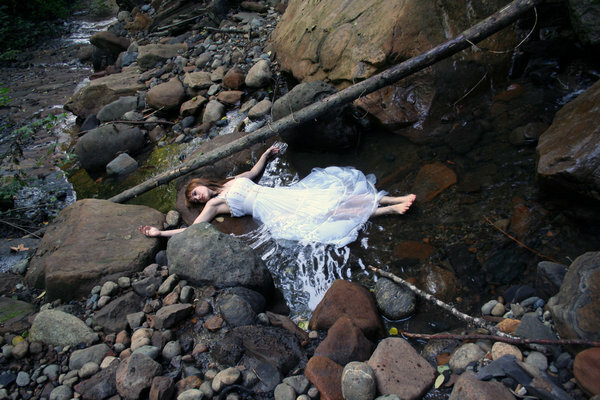 The trickle of the river’s current seeps past you, catching your white dress in its tide and attempting to pull it along. Your eyes are closed, your body is broken. You look like a crippled doll left behind by a careless child. You remind me of a discarded piece of trash. Your hand hangs daintily over the rocks, bone dry from the sun’s rays. Your hair is tangled with the weeds around it. Your dress catches around your legs. Your legs catch in the rocks, wedged helplessly amongst the boulders. Your last breath left you hours ago, sacrificed to the stream in which your body comfortably lies. Your last scream was swallowed by the gentle tide. Your last struggle was overpowered by the water around you. I turn to leave you twisted amongst the stones and water. My bare feet slip from the stream and tuck themselves amongst the dying leaves. I offer a small smile in departure. I break away from the task and vanish into the woods once more. I walk away a free man and leave behind a trapped body and a swallowed past.